ARRA News Service: Do Socialism and Communism Create Opportunistic Tyrants Like Stalin? Do Socialism and Communism Create Opportunistic Tyrants Like Stalin? 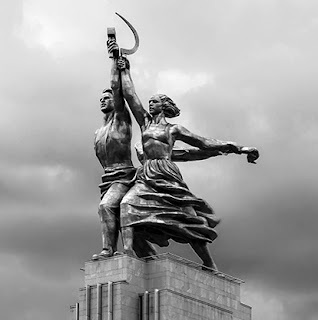 by Chelsea Follett: The admiration of your fellow college students for communist leaders is slightly down from last year, according to the annual report on U.S. attitudes toward socialism, which was released by the Victims of Communism Memorial Foundation. Joseph Stalin saw the greatest fall in popularity, from 12 percent of millennials reporting a favorable impression of him down to 6 percent. However, a horrifying 23 percent of Americans between ages 21 and 29 believe that Stalin was a “hero.” Also, 32 percent of millennials hold a favorable view of Karl Marx, slightly down from 34 percent last year. This drop in popularity is comforting, but only slightly. Chances are you have friends who still idealize socialism, communism, and the men who enforced these ideologies with an iron hand. But what they probably don’t realize is the awful truth about these utopian visions of a better world. Let’s quickly walk through some of the history they ought to consider. Sitting in the reading room of the British Museum, Marx theorized that society was a struggle between wage laborers and the owners of the means of production, and that the latter were “class enemies.” He feared that factory owners were exploiting factory workers, farm owners were exploiting day laborers, and so on. Many university students today share his fear of exploitation, rail against “the one percent” and the “privileged,” and desire a class-free society. Chang notes that since China’s economic liberalization, factory work has allowed hundreds of millions of Chinese workers to escape rural poverty to become middle class, and that most factory workers go on to start their own small businesses. They work in factories willingly because the alternative is grinding rural poverty. Marx and his followers, sadly, did not realize that capitalism-driven industrialization ultimately creates widespread prosperity, and they ended up hurting the very workers they aimed to help. Thanks in part to the factories that Marx detested, the United Kingdom’s average income was three times higher when he died than when he was born. After communists seized power in Russia a century ago, in the name of equality, anyone who was too well-off had to be identified and punished. Those with specialized knowledge, such as engineers, or those who had “non-labor income” were suspect. In the Russian countryside, any farmer who produced enough food to sell as surplus, as opposed to any farmer who produced only enough for his family, was labeled a “kulak”—a class enemy, engaged in the alleged crime of enrichment through trade. Any farmer who hired help, who owned a creamery or other machine, or who rented out agricultural equipment, was also labeled a “kulak.” The kulaks’ poorer neighbors were encouraged to take away their homes and steel their possessions. “You see, they can’t make a revolution with white gloves. Annihilating the kulaks is a bloody and difficult process, but it has to be done. Marusia’s tragedy isn’t as simple as it seems to you. What was her husband sent to the camps for? It is hard to believe that he wasn’t guilty of anything at all. You don’t end up in the camps for nothing.”The man quoted above was eventually arrested and shot. No specific charges were ever given. His wife was sent to the labor camps shortly thereafter. That anecdote is representative of the madness of that era. Millions of “class enemies,” political dissenters, and other unfortunate victims were sent to work in the Gulag, the forced-labor-camp system created under Lenin and greatly expanded under Stalin. Anyone who tried to escape was summarily executed. Those close to Stalin were not exempt, and more than a third of leading camp executioners ended up as prisoners in the camps themselves. The slave labor of the camps helped sustain the ruling class of the allegedly classless Soviet regime as the economy collapsed. Agricultural productivity plummeted following the removal of the kulaks and the collectivization of the farms. As millions starved to death, some resorting to cannibalism to survive, Stalin forbade use of the words famine, hunger, or starvation. Even doctors dared not diagnose a starving patient’s condition accurately. Stalin blamed the clear failures of his centrally planned system on deliberate sabotage and undermining of the economy by disloyal elements. He claimed that hidden enemies were everywhere and used that as an excuse to send more and more people to death and to the labor camps. And they would see that he was no hero. Chelsea Follett (@chellivia)is the managing editor of HumanProgress.org, a project of the Cato Institute. The Intercollegiate Review (IR) is published by Intercollegiate Studies Institute (ISI) and is dedicated to advancing the principles that make America free, virtuous, and prosperous. ISI shared this article with the editor of ARRA News Service. Tags: Socialism, Communism, Create, Opportunistic Tyrants, Like Stalin, Chelsea Follett, Intercollegiate Studies Institute, ISI To share or post to your site, click on "Post Link". Please mention / link to the ARRA News Service and "Like" Facebook Page - Thanks!